Tupelo Honey looks ok when you enter but it did not take long to be disappointed with this place. All the food on the counter is open and looked stale. The main dishes in the counter fridge were already prepared and cooked, and would only be warmed up if ordered. Right next to the window seats was a shelf filled with dirty plates and cups. If that wasn’t enough to put us off, then the open bin next to it definitely did. There is quite a small seating area downstairs; the wooden tables and chairs were wobbly. Tupelo Honey has outdoor seating but it is very narrow and cramped. The whole time we were having our drinks here, we didn’t feel at all relaxed. We were actually quite relieved when we left. Tupelo Honey is open till late into the evening. Even though we went there during the afternoon, the upstairs seating was closed. They have two additional floors; one of which is a roof garden. As for the drinks, the mocha and latte coffee was nice. They serve Illy coffee and they also do soy milk. Some of the staff were friendly. It is a shame that Tupelo Honey hasn’t made that extra effort with the state of its establishment, from the standard cleanliness to the seating and quality/display of food. I strongly recommend that people avoid Tupelo Honey. After having gone there almost every day for a fortnight, I was verbally attacked by the owner for doing work in her café. Moreover, she accused me of sitting there for hours whilst only having coffee. If she had of politely informed me that the area I was sat in was for diners only then I would have happily moved on, but I was shocked and appalled by the way she spoke to me. Her manner was aggressive and intimidating and any time I tried to interject, she literally shouted over me. I had recently been going to Tupelo Honey on a more regular basis but had been going occasionally for several years. It has a really nice décor, the food is good and the staff are generally pleasant. So I was especially shocked by this sudden outburst from the owner. Not only was her behaviour totally out of line but her accusations were incorrect. She told me, sinisterly, that she had been watching me for the past few days, even though I’m certain I hadn’t seen her, and said that she had her staff ‘keeping tabs’ on me. But more than her ridiculous claims, the way in which she literally cornered me was unbelievable. Working in customer service, I know that the customer isn’t always right. But to behave as she did is incredible. I was sure to tell her as I left that she had lost my business and that of everyone I can advise. Although I would rarely wish this on anyone, Tupelo Honey is a business that deserves to fail. People cannot be allowed to get away with bullying their staff and customers as its owner clearly does. I was actually relieved when I read other reviews to see that I wasn’t the only person who had been on the receiving end of her assaults since I left the incident feeling as though I had been victimised. It’s a shame that what would otherwise be a lovely café is ruined by the person who should have its best interests at heart. I would have to agree with the previous comment. Excellent platters, great to have with a bottle of wine between a few friends or someone special. The different floors all provide various atmospheres. An open terrace on the top floor, as well as charming restaurant, and a cozy room on the ground floor. Great cocktails if you’re feeling thirsty, great cakes if you’re feeling hungry, home cooked meals served by very good staff, and all of that for a bargain. 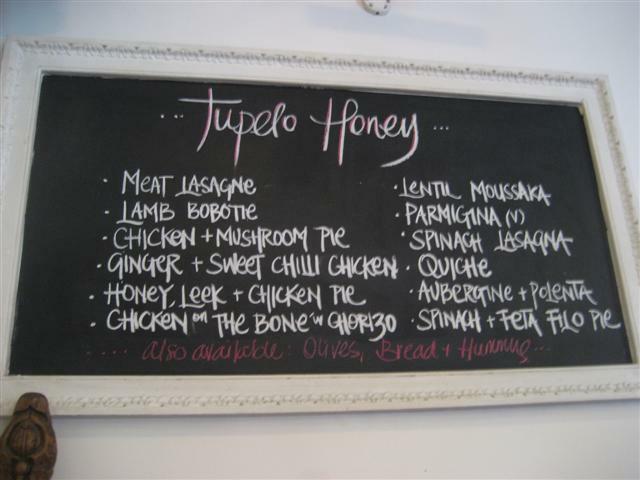 I recommend Tupelo Honey, absolutely! 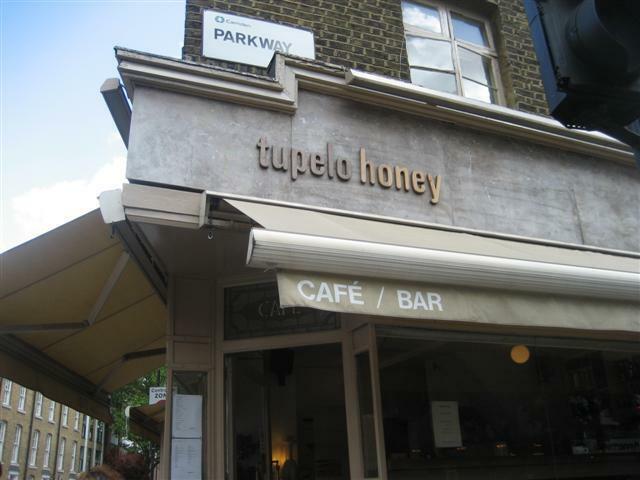 Seven years ago, as I found myself in Camden for the very first time after moving to London, I discovered Tupelo Honey on parkway road, as I was craving a piece of cake and a coffee. I stepped into this charming little place, and was enlighten by amazing staff as well as great food disposed behind the counter. After ordering a coffee and a slice of carrot cake, I suddenly realised I was feeling even more hungry, so ended up having a whole meal with a few friends. I have been going back every week for the past seven years, still impressed by the consistency of the food, the drinks, and the service. The owner has noticed me as a regular, but even before that, her talent as a chef and incredible sense of humour really made it feel like home. The organic and home cooked food presented behind the counter is all absolutely fresh, cooked on the same day, and great to have with a bottle of wine, on a date or with a few friends. I recommend Tupelo Honey to everyone who is feeling a little hungry, thirsty, or ready to have a feast. Food was nice, staff were pleasant but the manageress who is possibly owner was horrific. I've never been made to feel so uncomfortable in all my life, I can't even believe what I heard, the mangeress if you can call her that was unbelievably rude to her staff and to us the costumers. On leaving the place the manageress attempted to discipline her staff in a manner that would be more suited for a police interview in a murder case, and when asked if she would mind doing this off the shop floor the aggression was moved towards us. All we wanted to do was to pay and leave. I feel bad for the waitress and the other staff to have to work with the wicked witch of Camden, just a shame as we had just discussed how much we liked the place. For the grief we got I would recommend some place else.